Benfica are rubbing their hands at the excellent performances being produced by Luka Jovic. The Serbian striker's on loan at Eintracht Frankfurt, who have the right to sign him in the summer. Portuguese newspaper Record explain how Benfica are hopeful of getting more than 18 million euros. Jovic is in his second season on loan in Germany. In his first year, he scored nine goals and set up two more in 27 appearances. This season, he's scored 22 goals already and created seven more in 36 games. Frankfurt have an option to sign him for six million euros which they will take up. But Benfica also have the right to 20 percent of any future sale: which could happen if Barcelona press forward with their interest in the striker this summer. While Barça have closed an agreement with Jovic, they have yet to finalise anything with the clubs. The first step is for Frankfurt to take up their option to sign him, taking Benfica out of the picture but leaving them with 20 percent of any future sale. It's believe Barça could pay as much as 60 million for the striker, who is currently with the Serbia team preparing for games against Germany and Portugal. If the figure is that high, 12 million euros more would go to Benfica. Added to the initial six million, that would mean they'd receive 18 million for the sale of Jovic. If Frankfurt can get more than that, Benfica would make even more. 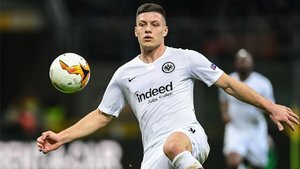 Barça aren't the only club keen on Jovic. Bayern Munich and various Premier League clubs are also following him, so a bidding war could break out.